The North Pole Flight . . . The airship Italia at Kings Bay, Spitsbergen, 1928. This photo provides a perspective as to the size of the airship. The Italia was designed and flown by Umberto Nobile who led the 1928 North Pole expedition that culminated in the Italia crash. north of the Svalbard archipelago. The Italia inside the hangar at Kings Bay, Spitsbergen. This massive structure was built originally to house the airship Norge in 1926. This photo clearly shows the guy wires used to support the side walls. The top was left open intentionally since the hangar was intended to provide protection from side winds only. The mooring mast at Kings Bay built for the 1926 Norge flight. The airship hangar at Kings Bay has long since disappeared but, amazingly, the mooring mast is still standing. The North Pole Flight. The great Norwegian explorer Roald Amundsen, who gained world-wide fame as leader of the first expedition to reach the South Pole, was among the first to pioneer the use of aircraft in polar exploration. After some brief exploratory flights from the northern coast of Alaska in 1923, Amundsen teamed with American adventurer Lincoln Ellsworth to fly in two Dornier Wal flying boats from Kings Bay, on the island of Spitsbergen in Norway's Svalbard Archipelago, to nearly 88�N, a record farthest north by air. The following year, in May, 1926, two more flights were preparing to depart from Kings Bay for the North Pole. On May 9, American Richard Byrd made the questionable claim of having flown to the North Pole and back in the Fokker tri-motor Josephine Ford. 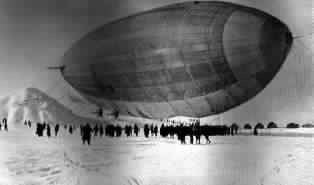 Five days later, the Amundsen-Ellsworth-Nobile expedition in the airship Norge flew from Kings Bay to Teller, Alaska by way of the North Pole. Following the flight a bitter dispute, played out in the world press, broke out between Amundsen and the Norge's designer and pilot, Italian Umberto Nobile. As a result, in 1928, Nobile returned to Kings Bay as sole leader of his own expedition in the airship Italia. On May 21, 1928, the Italia crashed on the ice north-east of Spitsbergen on the return from a claimed attainment of the North Pole. The Italia carried a crew of 16. At the time of the crash, nine crewmembers--including Nobile--were in the main cabin gondola and were thrown onto the ice. One additional crewmember was in the rear engine gondola and was also thrown to the ice, but was found dead. Six crewmembers were inside the envelope and disappeared when the envelope, relieved of the weight of the gondola, floated away in free-flight. Their remains were never found. Remark-ably, a number of supplies, including a radio and a tent, were also thrown to the ice. The radio eventually allowed survivors to establish contact with the outside world. Survivors used a red dye to paint red stripes on the tent to make it more visible from the air and the site became known in the extensive press coverage as the Red Tent. The departure point of many early historic North Pole flights, including the Italia, was known as Kings Bay but the location is now the international scientific community of Ny �lesund. 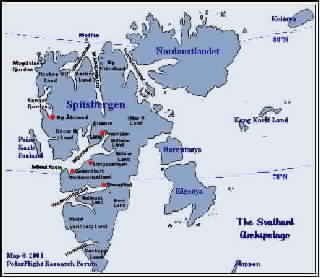 For a glossary of Norwegian-English place names, click here.